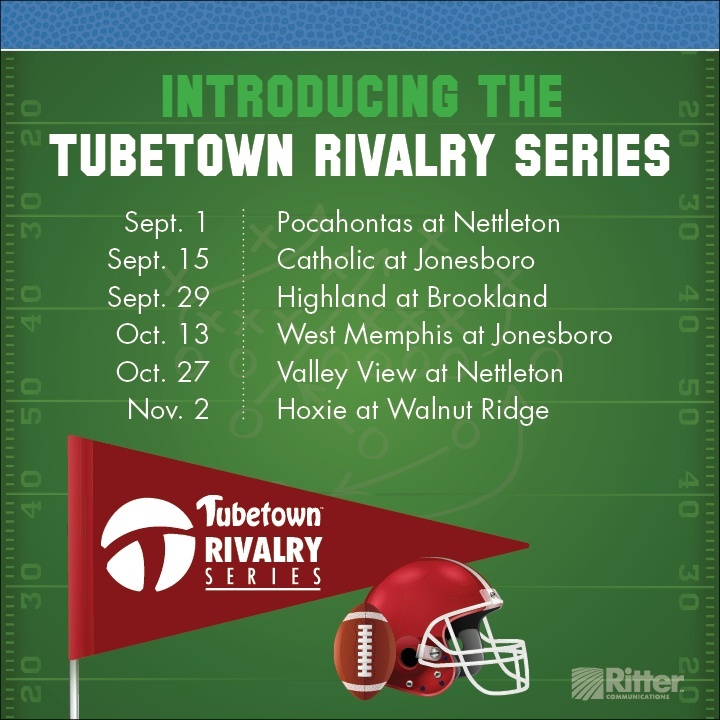 Tubetown, the local content and coverage channel of Ritter Communications, has you covered when it comes to high school football, and this season, Tubetown is proud to introduce the ‘Rivalry Series,’ which will feature six of the top matchups in Northeast Arkansas. Tubetown’s 2017 football coverage kicks off in Arkansas this Friday, with the Pocahontas-Nettleton game. On Sept. 15, Tubetown will be at Jonesboro High School as the Hurricane host Little Rock Catholic. The schedule also includes the Highland at Brookland (Sept. 29), West Memphis at Jonesboro (Oct. 13), Valley View at Nettleton (Oct. 27) and one of the area’s biggest rivalries, Hoxie at Walnut Ridge, on Nov. 2. Each game starts at 7 p.m. In addition to airing live on Tubetown’s broadcast channel - 21 in Northeast Arkansas - each game will be available for free via live stream on YouTube. Tubetown will air replays of all the games on its cable channels, and all Tubetown sporting events will be archived online at TubetownOnline.com. You can also receive a DVD copy of any game by visiting TubetownOnline.com.